Student MAPs help you locate a new destination for your students! Through a MAPs journey, your students will emerge as more empathetic and tolerant citizens. The newly expanded student matinee season exposes students to the best the Alley has to offer in exclusive 10AM performances. Every student matinee includes a talkback with the cast, crew, and creative team - allowing students to chat with some of the country’s most prolific and respected theatre artists. • or a combination of them all! Alley Master Teaching Artists and Mainstage Actors can help your students explore the play and its themes in the classroom or at the Alley – before, after or during your visit. This public event showcases the work middle and high school students have done through Alley in-school programs including Playwriting 360°, First Draft, Slam Poets, Monologues and Shakespeare. Transform memories into personal narratives. Students explore a combination of playwriting and creative non-fiction techniques to generate stories. These first drafts create a solid foundation for college essays, monologues, and devised performance. Delve in to script and character analysis by working on the actor’s calling card – the monologue. Students are guided through a process to help them create character, environment and clear intention; essential foundational skills for all performers. Explore the powerful language of the body, and investigate how physicality influences characters and emotions. 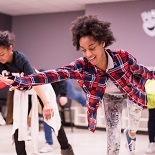 Students increase physical and emotional flexibility, develop a sense of curiosity about movement, and learn to make strong physical choices as performers. Your residency can be tailored to your specific needs. Develop the skills necessary to battle effectively and safely on stage. Students explore techniques for armed and unarmed combat, steps for building detailed fight choreography, and safety measures to protect all involved. Perfect for beginning and advanced performers. Explore what it means to be heard. The physical voice is developed by exercises that strengthen breathing muscle and improve vocal resonance, pitch, and articulation. Students grow the artistic voice alongside the physical by building a connection between the voice, body, and the world. Explore social justice issues that impact your community and your future, using Forum Theatre techniques pioneered by Brazilian theatre artist Augusto Boal. Students engage in meaningful discussion around difficult topics and explore potential active solutions to real life problems. This residency includes an optional Forum Theatre experience for the community. Learn through exercises and unscripted scenes how to think creatively on the spot. An important foundational skill, Improv fosters a sense of ensemble, strengthens listening skills, responsiveness, and encourages bold choices. Perfect for beginning and advanced performers. Explore the power of words to create worlds by developing a 10-minute play. Students perform writing exercises to develop clearly defined characters, shape scenes, and exchange constructive feedback. Click here to meet the Teaching Artists who bring these programs to life in your school!